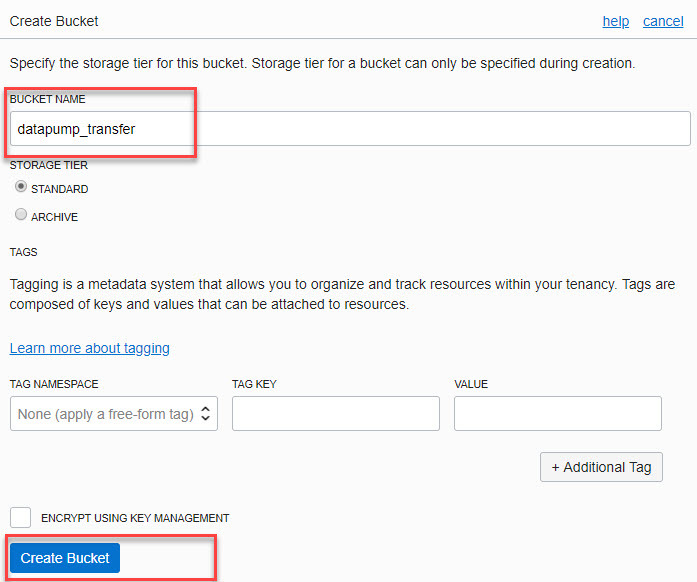 non TDE – Attention: non TDE on-premises data stays unencrypted in the cloud !!! OCI CLI and opc_install.jar plus the .pem file have to be in the same directory. drwxr-xr-x 7 oracle oinstall 4096 Nov 2 12:45 .
drwx------. 23 oracle oinstall 4096 Nov 2 12:45 ..
oracle@ol7ora18:~/migrate/bin/ [ORA18] ./create_backup_from_onprem --config-file /home/oracle/.oci/config --display-name testimport01 --availability-domain $AD --edition STANDARD_EDITION --opc-installer-dir /home/oracle/migrate --tmp-dir /home/oracle/migrate/onprem_upload --compartment-id $C --rman-password welcome1 Connecting to Oracle database Oracle version is:18.3.0.0.0 Checking the archive log mode of the database Checking if the database is open Getting database name and database unique name Database Id:1281053557 Name:ORA18 UniqueName:ORA18 Fetching character set Character Set:AL32UTF8 Fetching national character set National Character Set:AL16UTF16 Fetching rac mode Rac mode:FALSE Creating external backup job resource... 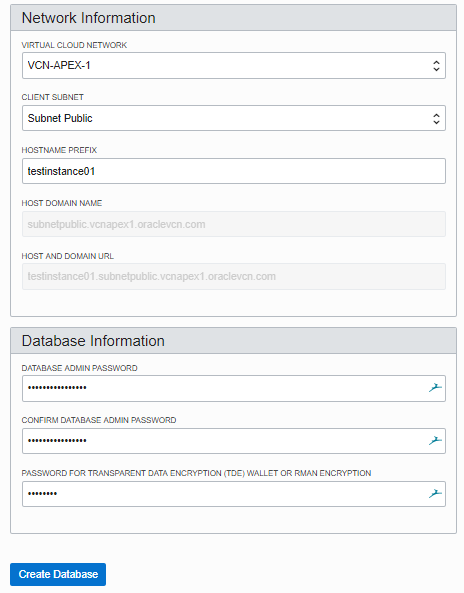 Created external backup job resource with id: ocid1.dbbackup.oc1.eu-frankfurt-1.abcdefghijklmnopqrst1234567890 Creating external backup job resource... 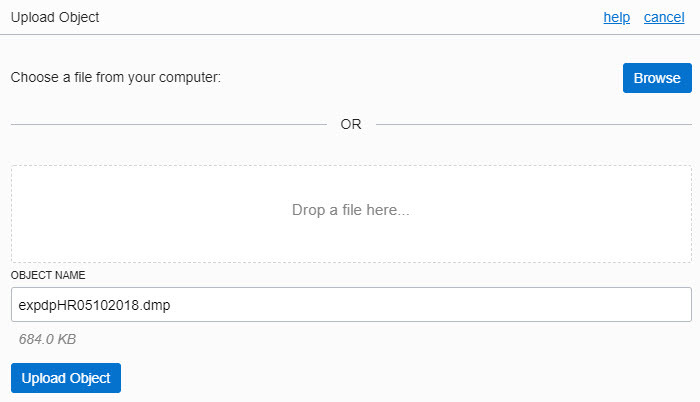 Creating external backup job resource... 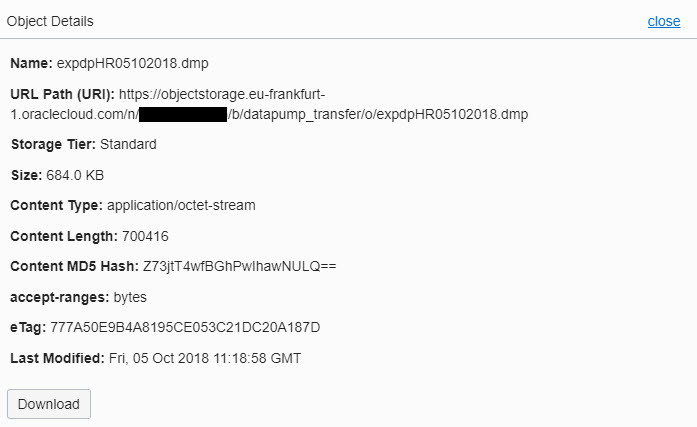 Waiting for completion of external backup job... Uploading parameter logs Setting up opc installer Executing command: java -jar /home/oracle/migrate/opc_install.jar -host https://swiftobjectstorage.eu-frankfurt-1.oraclecloud.com/v1/dbbackupfra -opcId 'iyA7xeIeR3abcdefghIJ' -opcPass <redacted_password> -walletDir /home/oracle/migrate/onprem_upload -libDir /home/oracle/migrate/onprem_upload -configFile /home/oracle/migrate/onprem_upload/opcORA18.ora -container iyA7xeIeRabcdefghIJKl Executing RMAN. It will take a few minutes to complete.. Completing the external backup job.. Response:200 External Backup created. Executing RMAN. It will take a few minutes to complete.. Completing the external backup job..
Well known from the Oracle Cloud Backup module . The RMAN backup is encrypted by default. Now we create a new database based on the Standalon Backup. Enter the RMAN backup password from the CLI job. The database will be re-created now. oracle@ol7ora18:~/migrate/oci-cli-scripts/ [ORA18] ./create_backup_from_onprem --config-file /home/oracle/.oci/config --display-name testimport01 --availability-domain $AD --edition STANDARD_EDITION --opc-installer-dir /home/oracle/migrate --tmp-dir /home/oracle/migrate/onprem_upload --compartment-id $C --rman-password ***** Connecting to Oracle database Oracle version is:18.3.0.0.0 OMF is required for the script to work. OMF is required for the script to work. To get acccess to the dump file on the Oracle Object Storage, a credential has to be created in the Oracle Autonomous Transaction Processing database with the DBMS_CLOUD procedure. For more information about the package, see the blog post from Christian Antognini – DBMS_CLOUD Package – A Reference Guide. The DBMS_CLOUD procedure needs a password value which is the token from the user account. If you don’t now your token, create a new one. 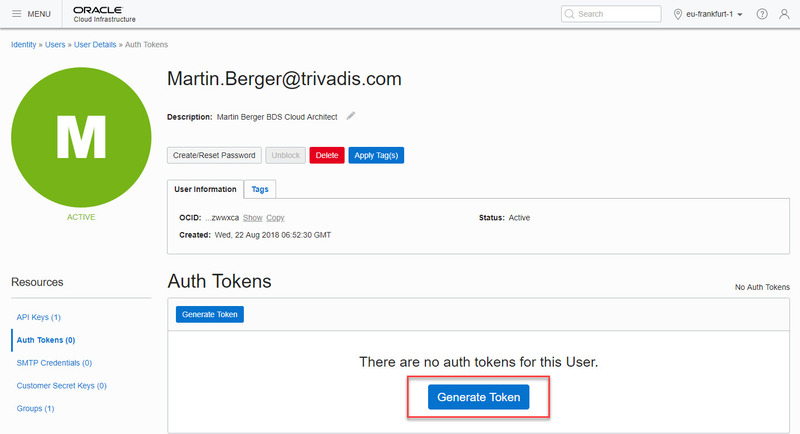 Go to Identity – Users – your username and click on the left side on “Auth Tokens”. Create a new token by click on “Generate Token”. The random generated string is the value for the DBMS_CLOUD password. Enter a name for the token and click on “Generate Token”. Note your generated token and “Close” the window. Login into the Autonomous Transaction Processing database as admin user and create a new credential called ATPCS_CRED. C:\oracle\product\instantclient_18_3>sqlplus admin/***MY_PASSWORD***@atphrdata_high SQL*Plus: Release 18.0.0.0.0 - Production on Fri Oct 5 13:43:58 2018 Version 18.3.0.0.0 Copyright (c) 1982, 2018, Oracle. All rights reserved. 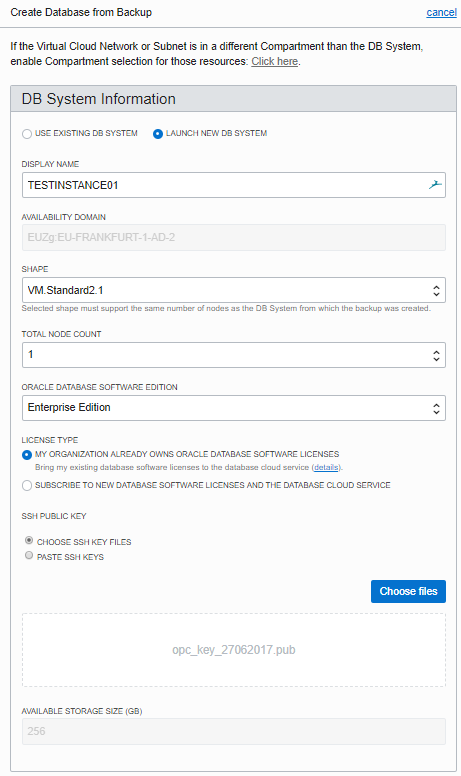 Last Successful login time: Fri Oct 05 2018 10:47:04 +02:00 Connected to: Oracle Database 18c Enterprise Edition Release 12.2.0.1.0 - 64bit Production SQL> BEGIN 2 DBMS_CLOUD.CREATE_CREDENTIAL( 3 credential_name => 'ATPCS_CRED', 4 username => 'martin.berger@trivadis.com', 5 password => '***MY_TOKEN***' 6 ); 7 END; 8 / PL/SQL procedure successfully completed. In the ATP, we create a new user called HRATP. The tablespace DATA is the default tablespace in an Autonomous Transaction Processing database and does not have to be defined. Two new Oracle Data Pump parameters to work with the Oracle cloud databases are credential and and dumpfile. The message about the existing user can be ignored. The logfile of the import process cannot be access directly, it has to be moved into the Object Storage with the DBMS_CLOUD package first. C:\oracle\product\instantclient_18_3>sqlplus hratp/***MY_PASSWORD***@atphrdata_high SQL*Plus: Release 18.0.0.0.0 - Production on Fri Oct 5 14:37:27 2018 Version 18.3.0.0.0 Copyright (c) 1982, 2018, Oracle. All rights reserved. Connected to: Oracle Database 18c Enterprise Edition Release 12.2.0.1.0 - 64bit Production SQL> select tname from tab; TNAME -------------------------------------------------------------------------------- COUNTRIES DEPARTMENTS JOB_HISTORY REGIONS LOCATIONS EMPLOYEES JOBS EMP_DETAILS_VIEW 8 rows selected. 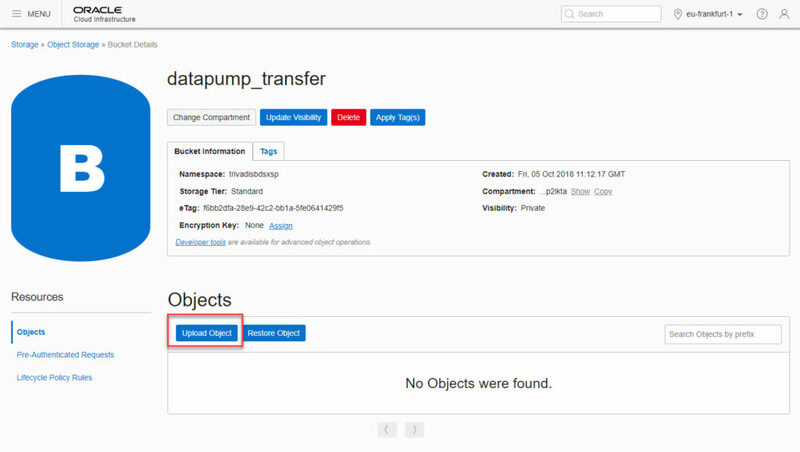 If all prerequistes are met, the data transfer with Oracle Data Pump is easy to configure and easy to handle. Take care about the token, only 2 token per user can be generated. If you losed it, you have to delete a existing token, rebuild it and re-create the credentials before you can import data again.